I remember while growing up, story time was a nightly ritual with my mom and I. I recently came across a beautiful children's book, that I will keep for when I have children of my own. 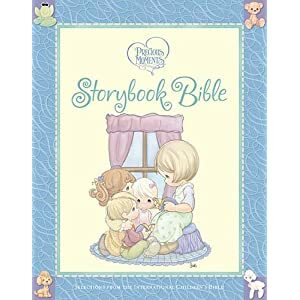 The Precious Moments Storybook Bible is a pretty decent addition to my library with a durable hard cover, one-hundred and seventy-nine pages of stories, full-color pictures, large fonts, and a decent number of extras included. The book isn’t a chronological “Bible” but rather a series of stories and lessons divided into color coded sections with labels such as “Favorite Bible Classics,” “Words of Praise and Wisdom,” and “More Stories of the Faith.” Each story is between two and four pages long with full-page illustrations placed at regular intervals. In the back is a section of Bible songs and prayers which come in handy if you’re trying to establish a bedtime routine. There’s also space to write in your own additions if you want to add some specific things to your child’s prayer. I received a book from Booksneeze, in exchange for my honest opinion, and a review of my experience. I did not receive any other compensation or incentive nor was I required to write a positive review. Individual results or experiences may vary. That is the most lovely bible. A Treasure. Thanks for sharing.